Neo-Soul is a genre of music that comprises of elements of Gospel, RnB, Funk, Jazz and Hip Hop. Before we dive into some essential chords and how to apply them, listen to these three Instagram examples of Neo Soul playing. The first example is recorded by Mark Lettieri, who along with being one of the finest solo guitar players in the world, plays for the jazz fusion grammy award winning band Snarky Puppy. The second example is from my good friend and incredible player Kristof Neyens. The third example is played by myself Simon Pratt. Now that you have an understanding of the sound of Neo Soul let’s look at some fundamental aspects of the chords involved in this genre. In example one I have demonstrated three-note shapes for an E major 6 chord and an E major 7 chord, both held for four beats. The hammer-on demonstrated in example two is a key sound in Neo-Soul. By hammering the 6th to the 8th frets on the ‘G’ string, you change the chord from an E major 6 to an E major 7. I recommend barring the 6th frets with your first finger and hammering on to your fourth finger. If you practice this example in this way, the following examples won’t feel as challenging. One of the most common chord shapes used in Neo-Soul is the major 9 shape with the root note on the ‘A’ string as shown in example three. Now apply the hammer-on pattern learnt in example two to the full E major 9 chord shape. Often in Neo-Soul, a chord shape will move around the neck with minimal regard for theory, preferring the ‘if it sounds good, it is good’ approach. 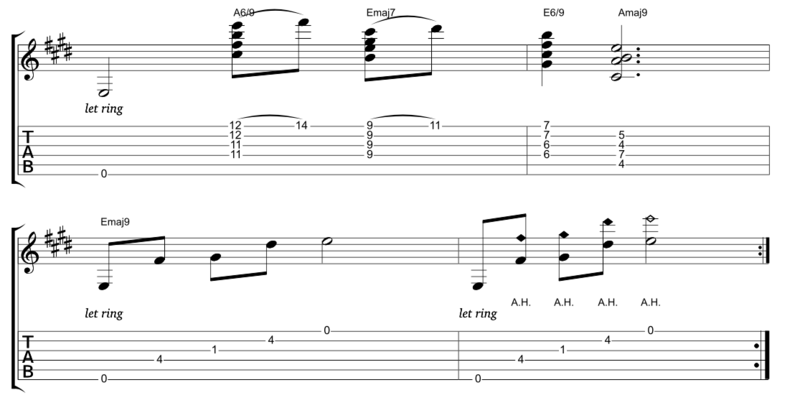 Example five shows how to move the major 9 hammer-on progression around the fretboard to create a classic Neo-Soul sound. Once you have learnt this example, play it along with the drum track below. A common sound used in Neo-Soul is using what are called ‘Quartal’ voicings. Simply speaking, chords that are made up entirely of 4ths. They sound very modern and provide one of the main elements of the final piece seen in example seven. I created a mini Neo-Soul chordal piece to round out this lesson. The piece starts off with a legato sequence which combines hammer-ons and pull-offs around minor 7 chords. I recommend practicing the hammer-ons and pull-offs without the full chord shape being played at first. In bar three an A/B or B11 chord is played followed by a B13b9 chord, which creates dissonance and is a classic chord voicing used in Neo Soul. The piece is then rounded out with a variety of ‘quartal’ voicings over a ringing low E bass note. The piece finishes with some plucked harmonics twelve frets above the E major 9 chord. Be sure to watch the Facebook live video to see how this example looks.